Instantly setting the mood for sensuality while relaxing body, mind and spirit with color and aromatherapy, Shunga's body softening Dead Sea Salt crystals turns bath water a calming blue hue as they infuse your surroundings with scent. 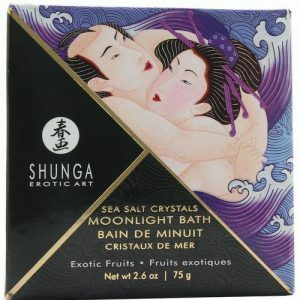 Instantly setting the mood for sensuality while relaxing body, mind and spirit with color and aromatherapy, Shunga's body softening Dead Sea Salt crystals turns bath water a serene blue hue as they infuse your surroundings with scent. Shunga's body softening Dead Sea Salt crystals turns bath water a pretty violet hue as they infuse your surroundings with scent. Shunga's indulgent Massage Candle offers true decadence for the senses, enhancing the thrill of a lover's touch, all the while nurturing and pampering the body.